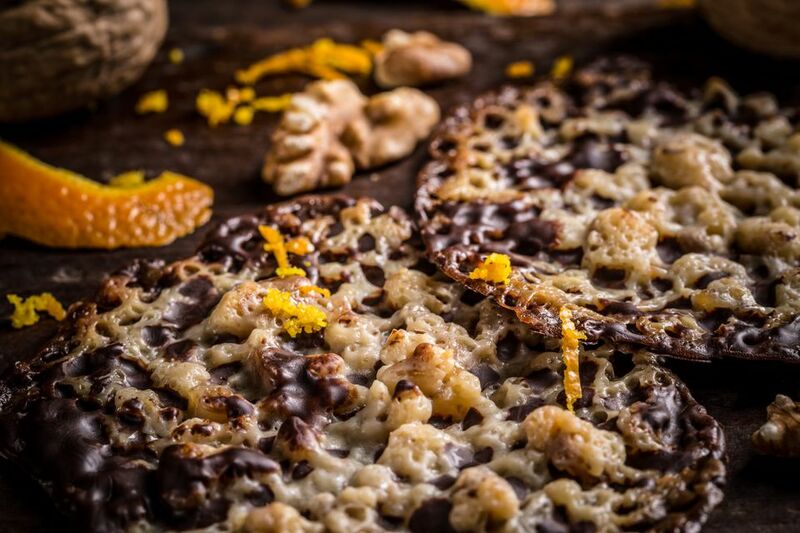 This recipe for Polish florentines or florentynki (floh-rrehn-TIN-kee) is made with candied orange peel (and other candied fruits, if desired), nuts and a smear of chocolate on the bottom. It is believed the cookie was created by King Louis XIV’s master pastry chefs at the Palace of Versailles for the Medici of Florence. Florentynki is popular at Christmas. Position a rack in the center of the oven and heat to 350 F. Line a baking sheet with a silicone baking mat or parchment paper. In a medium bowl, stir together 5 ounces blanched skinless finely chopped almonds, 3 tablespoons all-purpose flour and 2 tablespoons finely chopped candied orange peel. In a small saucepan, place 3/4 cup sugar, 2 tablespoons heavy cream, 2 tablespoons light corn syrup and 5 tablespoons butter. Cook over medium heat, stirring occasionally until mixture comes to a rolling boil and sugar is completely dissolved. Continue to boil for 1 minute. Remove from heat and stir in 1/2 teaspoon vanilla, and pour sugar mixture into almond mixture, stirring just until well combined. Let cool 30 minutes. Using a 1 1/4-inch cookie scoop, portion out dough and roll each piece into a ball in your hands. Place 3 inches apart (they will spread considerably) on the prepared pan and bake 10 to 11 minutes or until golden throughout. Let cool on baking sheet 5 minutes then transfer to cooling rack. Repeat with remaining dough. Melt 8 ounces dark chocolate candy melts according to package directions. Candy melts are preferred to chocolate because they hold up better when the cookies are stored. Spread a light coating of candy melt on the bottom of each cooled cookie. Let dry, chocolate side up, on a cooling rack. Store in an airtight container when candy melt is hard.